I debated flashing my stash. There's a lot. I mean, a lot. And while much of it is beautiful, interesting and worthy of admiring gazes, well, it's a lot. So instead of showing you all of it skein by skein, I'll show you most of it from 20,000 feet. 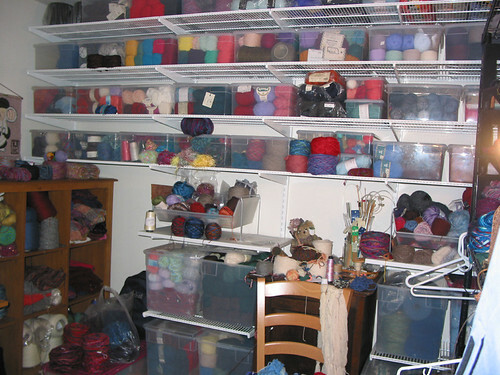 And you'll get an idea of where the yarn room organization is (mostly done but still in progress). And you'll just have to imagine the rest. Tonight: fiber dyeing. And maybe a finished Picovoli! *Wails* I want a yarn room too. Your stash looks so neat and organised.